A Marketing Monday follower. Although not quite as crafty as this. Cool - I tried a few things with soda cans while working on this challenge but nothing I was satisfied with - these are really cute!! I'm a new Monday Follower! Your site is so cute! To find some great deals and Freebies visit me at http://www.rockindeals4you.com/?p=4792 and sign up for my newest giveaways! great tutorial! thank you :) come on over and link up to making monday marvelous! Now I've heard everything and plus what a terrific idea!! I love the bracelets - who would ever guess! Amazing job. Thanks for the toot and clear pictures. You made some neat bracelets! I should learn to do some coke can recycled crafts, since I'm so addicted to them...and I love them better straight from the can! Thanks for sharing. Cute idea! And sooooo "green"...love it! Now this is just tooo cute. My DGD would love one of these. Thanks for the great tutorial. I want to try these. I came here via Met Monday. Glad I did. Drop by and visit me at Pittypat Paperie sometimes. Those are pretty neat. I wouldn't have thought to use my sewing machine. Good luck! WOW! LOVE the recycling and the fact you made something practical AND beautiful out of it!! I love how they turned out! I have a weekly blog party especially for people to share the things they've made to be worn. Stop by on Thursday if you'd like! This is pure genius. I've sewn through chipboard before, but never metal. I must try this. I love how they turned out! It's two for one in recycling -- fabric scraps and cans! Way to go green, and very cute too! Thanks for sharing ... I've posted a link. Very cute idea to wrap it with fabric! I've made them with just the cans before, but I like the fabric scrap addition! Once again cute and crafty! Thanks for linking up @PonyTails&FishScales! adorable. love finding new ideas like this! very cool! ooh how i wish i had a sewing machine! thanks for linking up to "AP Tuesdays!" Did you have one of these on Sunday? Your braclet caught my eye. Interesting idea and fun way to make coordinating jewelry!! It has my vote. I did NOT know you could sew pop cans. I don't think I would even dare try!! 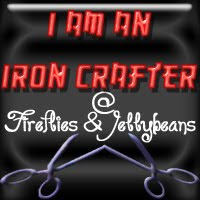 I didn't know the iron crafter started. These are fabulous and creative. I love using unexpected materials. Another great idea!! Thanks for linking it up at Fine Craft Guild DIY Linky Party. Do join again with an equally great tutorial next party Wednesday. Your crafts are so great and amazing! like this one, I think it cheap and economical but it's beautiful, I would definitely try this one. Thanks for sharing!